Kakizome (書き初め or the „first writing of the year”) is the Japanese term used for the first brush-writing of the year, performed traditionally on the second day of January. Other names of this event are 吉書 (kissho), 試筆（shihitsu) and 初硯（hatsusuzuri). It is interesting to observe how much emphasis is put on a number of „first” things in Japan. We can say that this time of year is the celebration of the „firsts”. Among others is 初詣で (hatsumōde), the first visit to a shintō shrine or 初釜 (hatsugama), the first tea ceremony of the year. The story of kakizome goes back to the distant past when it was celebrated in the imperial court only. Then, over the course of centuries, it had spread over Japan and by the end of the Edo-era (江戸時代, 1603-1868) it became a popular, nationwide event. Traditionally kakizome is done using freshly rubbed ink and the first water drawn from the well on 1 January. Ink grinding provides perfect opportunity for meditation and is always performed with the greatest care. Once the ink is ready, the writer lifts up the brush and with steady strokes, smoothly and uninterruptedly brushes the calligraphy on paper. This moment perfectly reveals the subtle meaning of the phrase 書は人なり (sho ha hito nari) „ calligraphy is the person” or in other words: our handwriting reflects our personality. In modern times people prefer to write kanji with a positive meaning. Kakizome is also often given as an assignment to primary or secondary school students for the winter holidays. These calligraphies are still often burned during the Sagicho festival (左義長祭り) on the night of 14 January. According to popular belief the higher your burning paper flies the more skilled you will be in the new year. Every year on 5 January thousands gather at the Nippon Budōkan (日本武道館) in Chiyoda-ku (千代田区), Tokyo to write out their wishes for the new year. 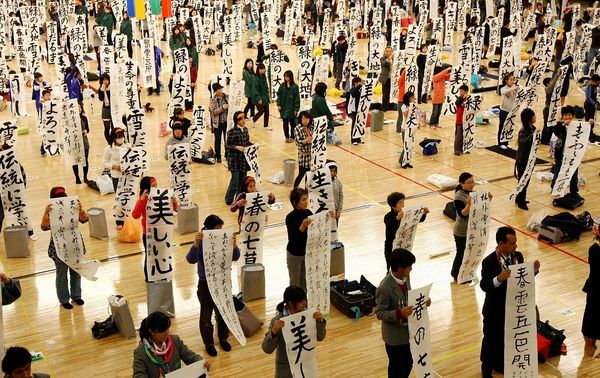 This is the first large-scale calligraphic event of the year, widely covered by the media. がんばる・ Go ahead, do it!